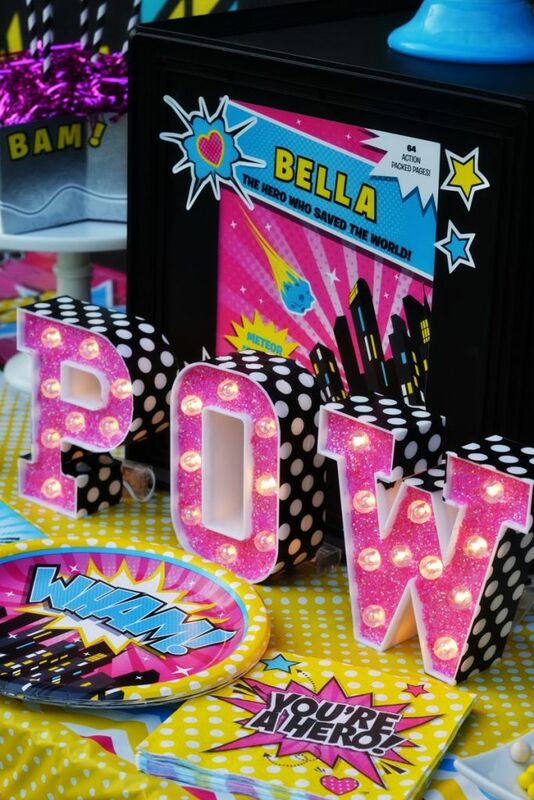 Who says girls can’t have superhero parties? 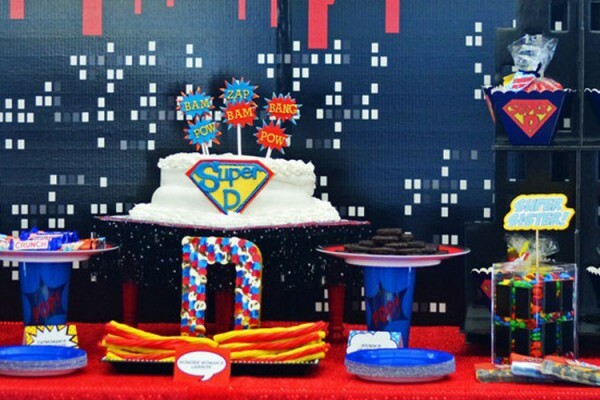 I once actually designed a superhero themed party for a 40 year old woman! Girls and women are heroes too! 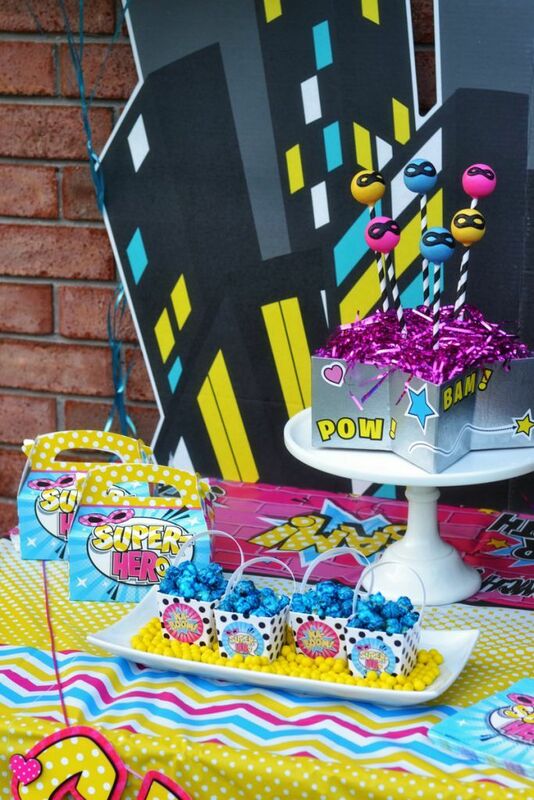 And what better way to celebrate your supergirl than to throw her a superhero themed party in pink, blue, and yellow? 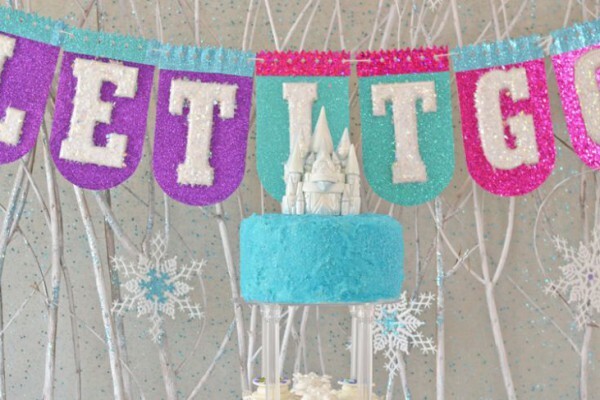 I love the play on words with this party collection. She’s a Super Her-O! 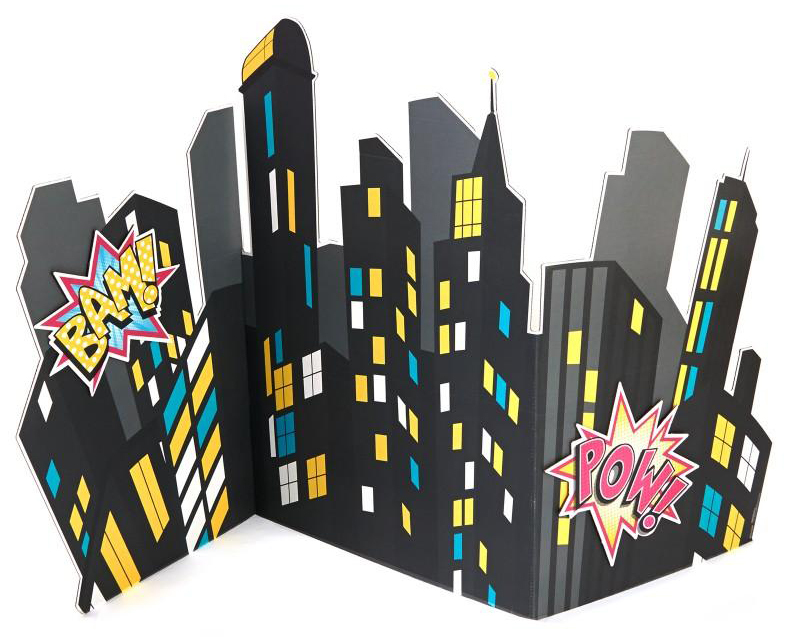 One of my favorite party products that Birthday Express has is this awesome city-scape cardboard backdrop. It’s useful in many different party themes! 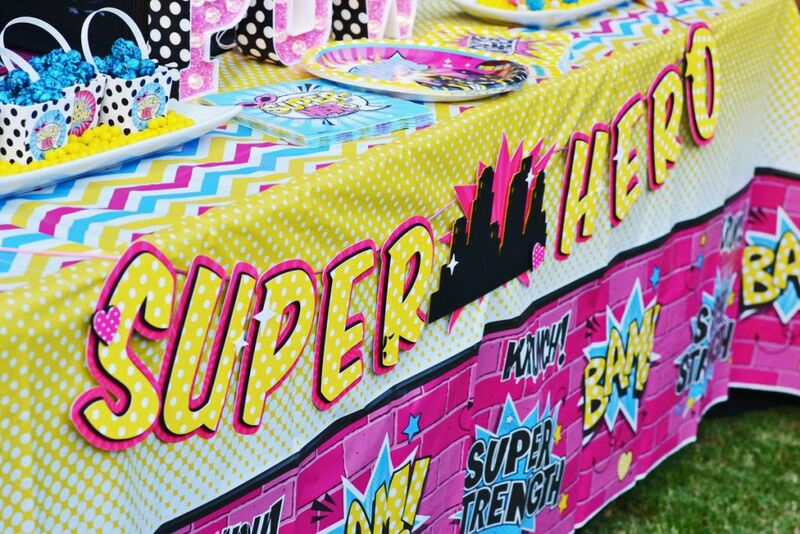 You could use it for a girl superhero party, but you can also use it for New York, for Ninja Turtles, or tons of other ways! 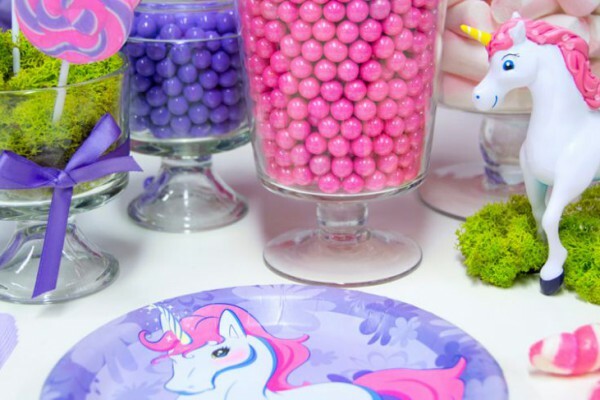 It’s a big impact for any party because it stands on its own and it’s such a great backdrop for your dessert table! 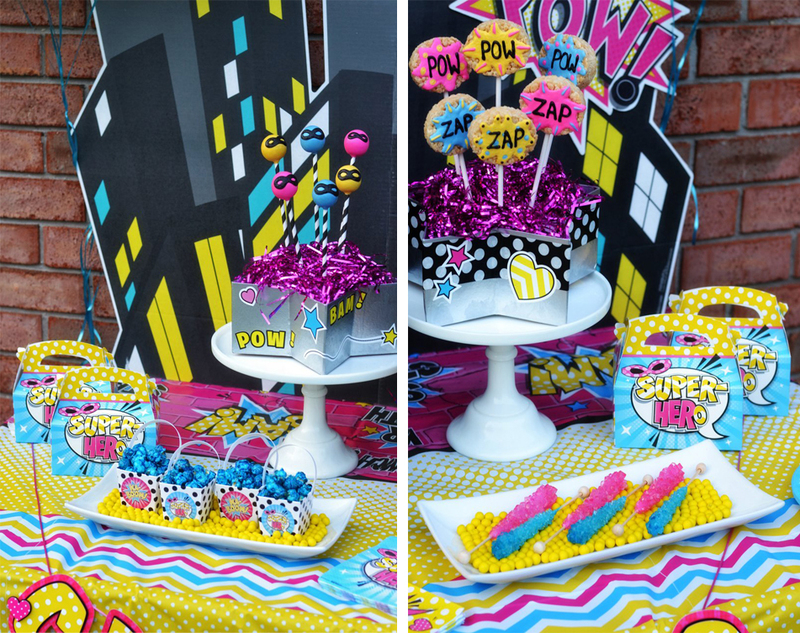 It would coordinate with a variety of fun girl or boy themes! I started my table design by using the cityscape as my backdrop, and then using the coordinating tablecloth for my table. 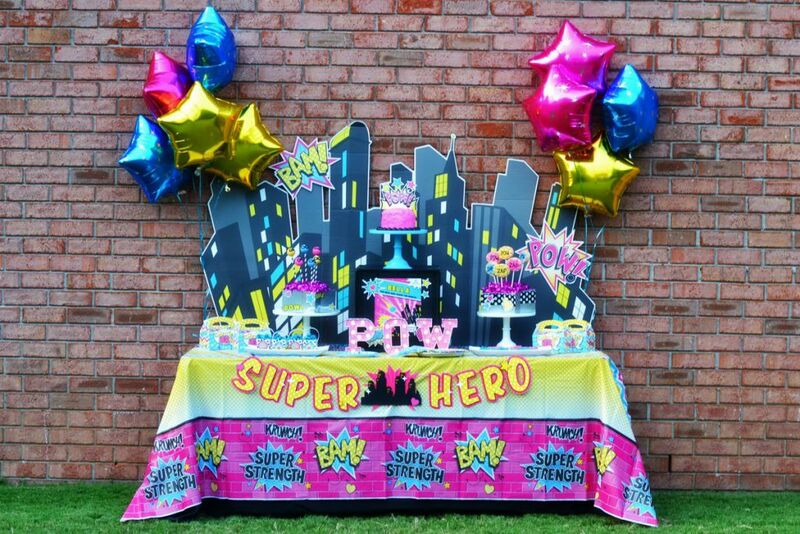 This cloth is designed to hang about halfway down on a standard table height, but for this party, I pulled it down in the front so that the yellow middle party gave me a great place to display this AWESOME paper banner by my friends at Piggy Bank Parties. 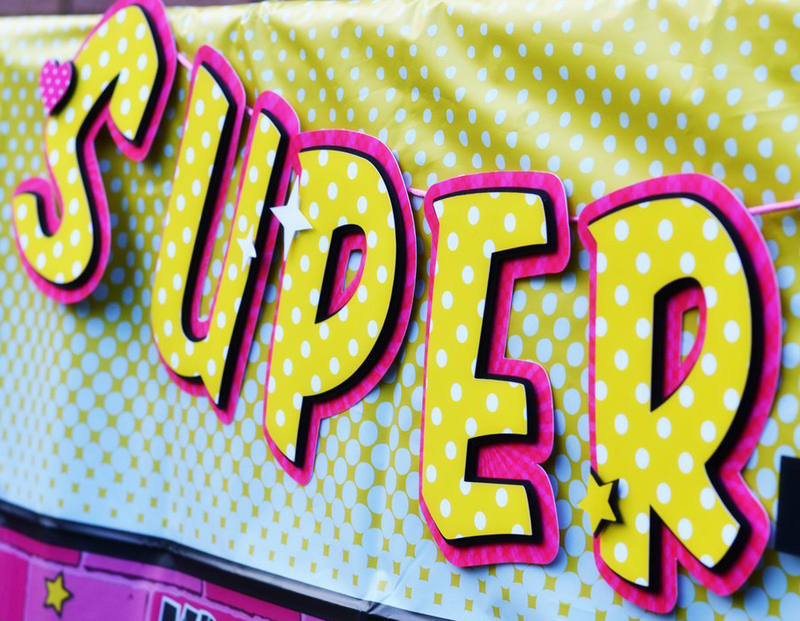 I sent them a preview of this Super Her-O collection and she designed this banner to match! It’s three-dimensional and so adorable! The detail is just amazing! For my cake, I simply baked a strawberry cake and then added hot pink icing with some pink sugar. Then, using some of the awesome wall cling decals from this theme, I put them onto cardstock for stability and then cut around them. I added some paper straws and inserted the designs right into the cake. I used these decals all over the party! To display the cake, I used a black storage bin that I turned on its top and used one of my blue cake stands to coordinate with the party colors. I applied these cool DIY decals to make your own comic book over. I added the birthday girl’s name using the letters in the kit. How fun is that? In the front of the box, I made some DIY marquee letters using washi tape and some glitter. 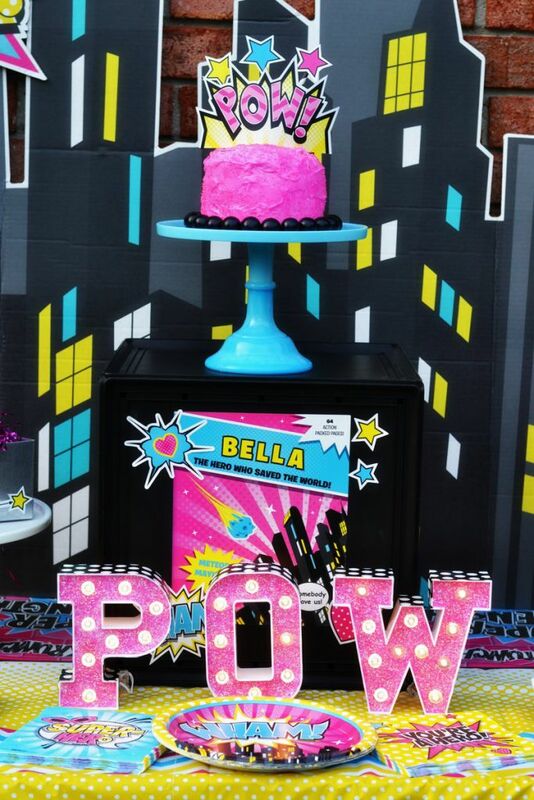 I mean, it had to say POW right?! 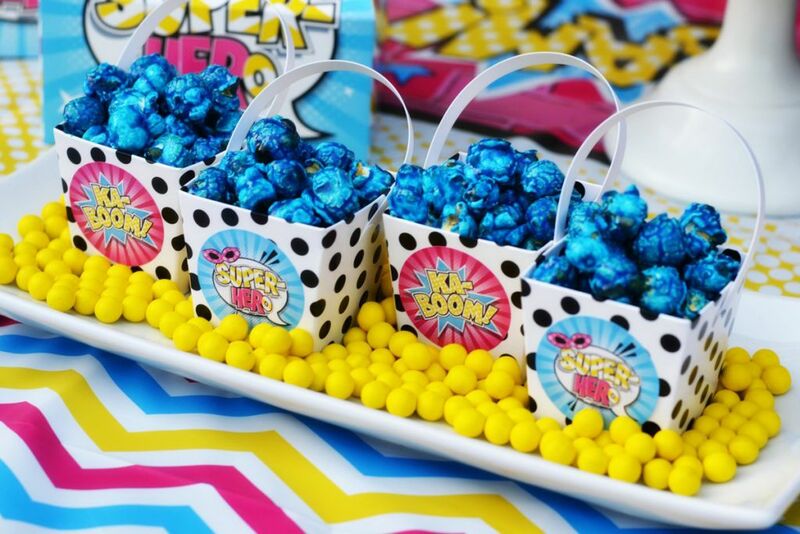 For my other party treats, I added some blue popcorn in cute little polka dot takeout boxes that I got at the craft store, as well as some classic rock candy. 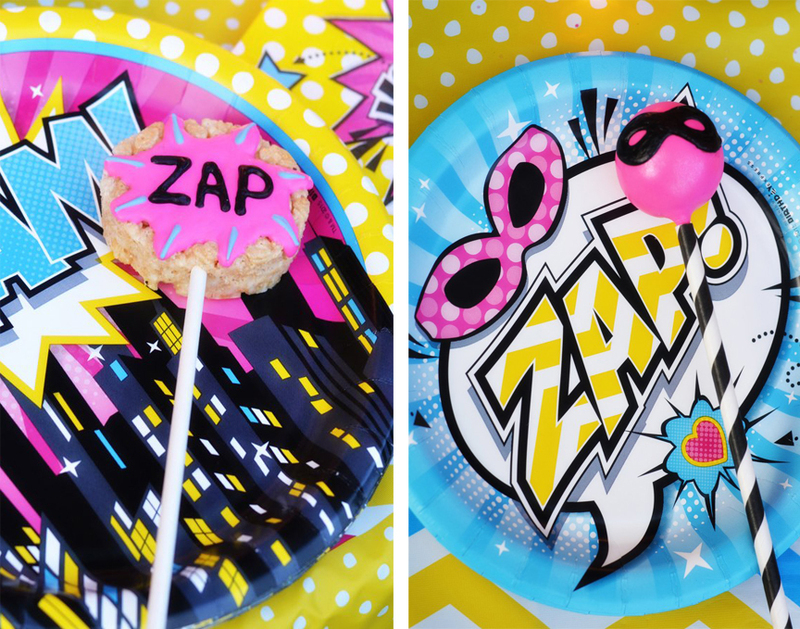 Then I had my friend Nicole at Bella Bakery make these awesome cake pops and Rice Krispy treats! I displayed them in star shaped boxes that I painted silver and embellished with tape and stickers. I added some cute striped straws to the cake pops to add some cute color and extra height. Then, I added sticks to the Rice Krispies treats to make them stand inside the box. 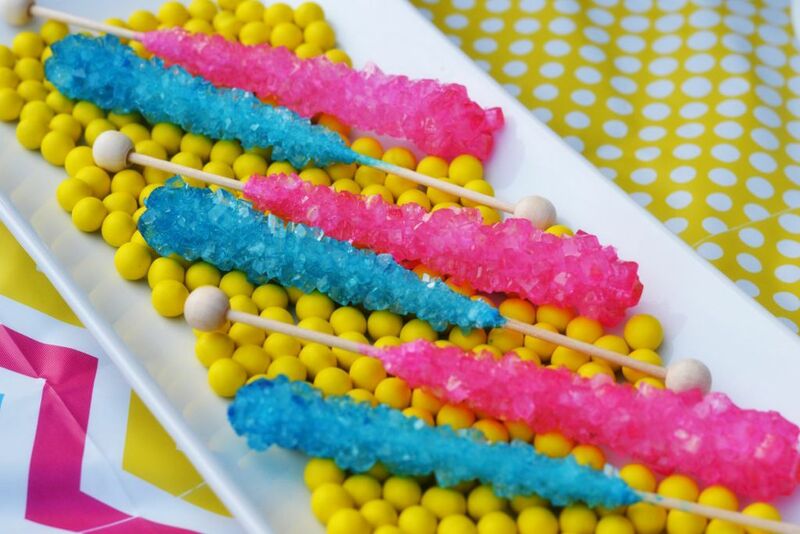 One of my favorite party tips is to add sticks to your treats! 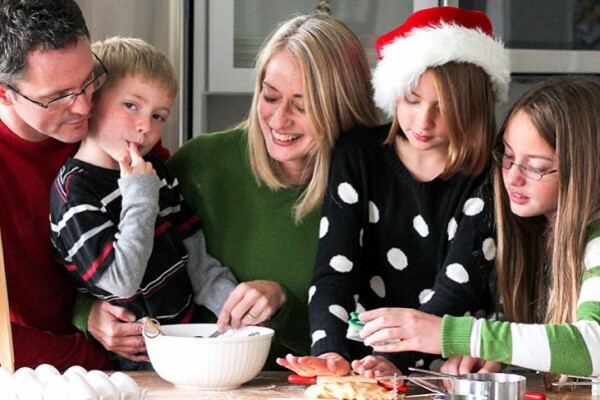 It makes them look great in a display and kids love to eat anything on a stick! 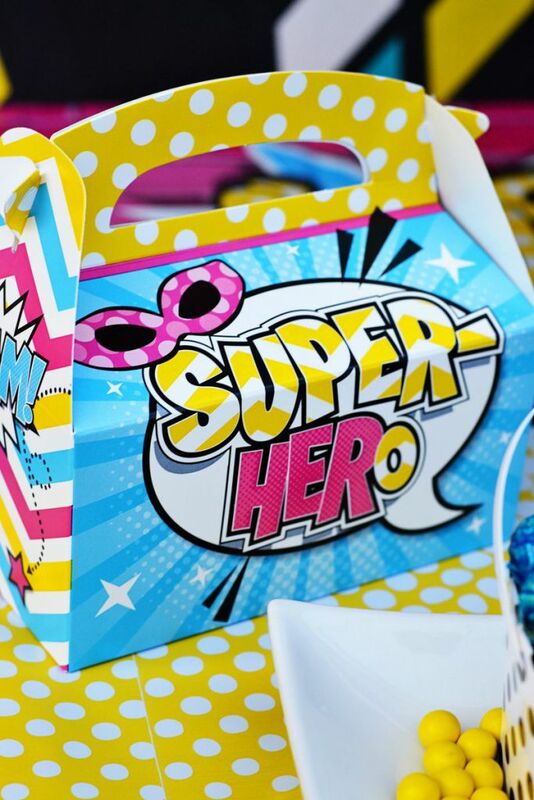 The guests were sent home with favor boxes full of fun stuff that all little girls would love! 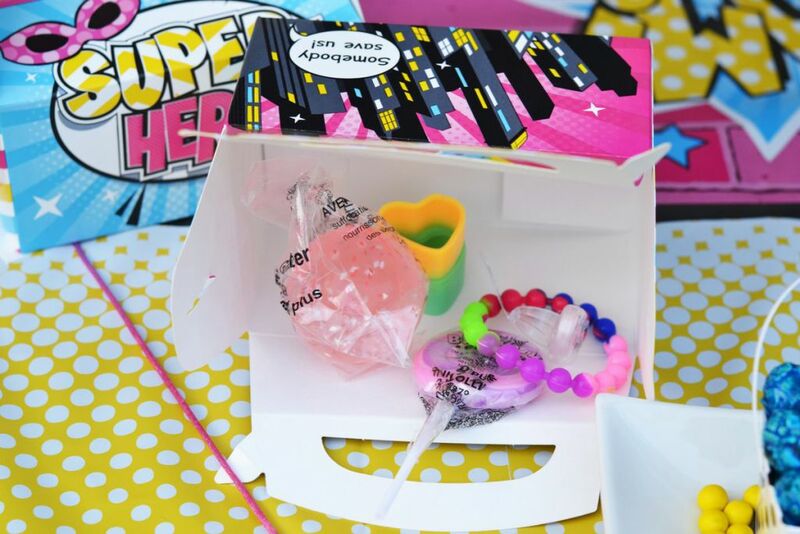 The best part about the favor boxes is that they are large enough to take home a cake pop or a Rice Krispies treat! 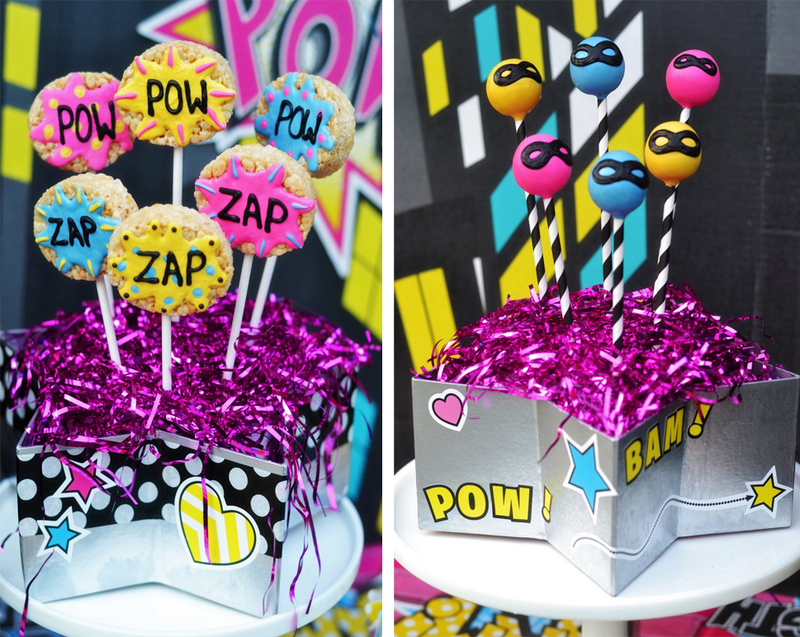 Throw your little girl this party, and you’re sure to be her superhero! 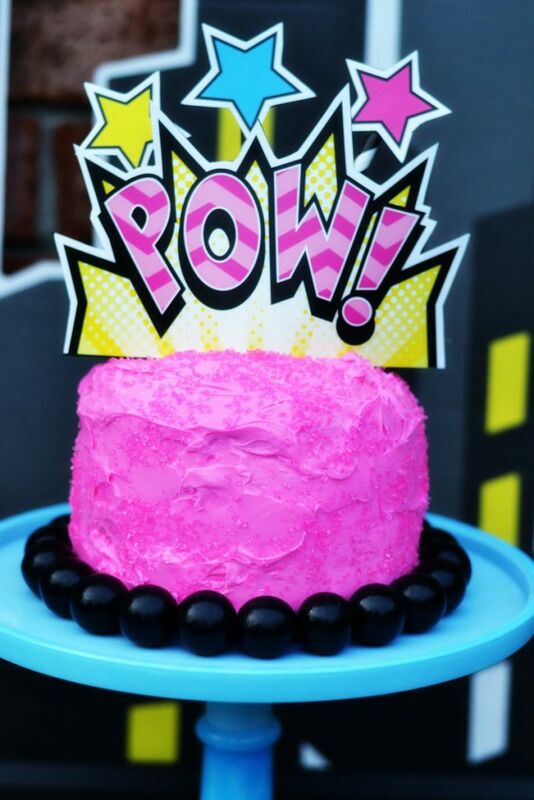 Click here to see all of the Girl Superhero Party supplies available from BirthdayExpress!